If The Rocketeer taught us anything, it’s that jetpacks are totally rad. Soaring through the air with the freedom to see anything and go anywhere has been a dream of mankind for quite some time, and there is no better way to do this than with an oversized rocket strapped to your back. Capcom and Airtight Games realize this, and have come up with the perfect excuse for you to take to the skies: killing dangerous aliens. The game is Dark Void, and I am pleased to report that the game may well live up to this promising concept. The E3 demo began with our hero, Will, leaping off of a cliff, thus beginning his first foray into jetpacking. Once airborne, I was able to hover, climb, descend, shoot and boost my way above a mass of water surrounded by mountainous terrain. I was asked to shoot a few sky bound targets after a few minutes of fiddling with my shiny new toy, and this was a breeze thanks to the nifty flight controls conceived for the game. The air-based action feels almost identical to the Xbox version of Crimson Skies, with fast-paced shooting, simplistic targeting, and several trick maneuvers mapped to the right stick. I was able to take down the mid-air objectives within seconds, and was then told to land at an enemy base to disable their defenses. After accidentally flying into a wall at full speed—instantly sending Will to a watery grave—I carefully guided my character to a walkway where an assembly of aliens was waiting to gun me down. 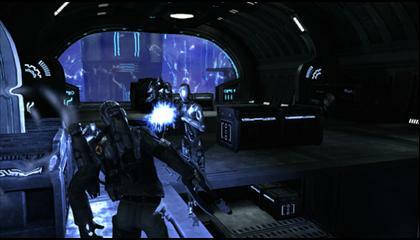 Once on solid ground, the game becomes a typical third-person shooter where you must utilize guns, grenades, and cover to eliminate every last invader that stands in your way. The gunplay is solid, proving to be functional as I traded laser blasts with the opposition. You can also go into hover mode at any time when on foot, allowing you to fly behind the enemy as they helplessly try and find a new hiding spot. All of the weapons that I found were alien in nature, which fits in nicely with the 1950’s sci-fi movie visual aesthetic that the game is going for. While I got to use a few laser-based pistols and assault rifles, I didn’t find any of Dark Void’s weirder, more unique weapons. After slaughtering countless creatures, I destroyed the base’s core and moved on to the next area. The action of Dark Void is definitely more fun when utilizing the jetpack, as the airborne combat felt great and the sense of speed was exhilarating. You can tell that Will isn’t quite used to flying, as the expressive animation showed his shakiness when sailing through the sky. The ground-based combat worked, but felt less original and entertaining as the jetpack segment. In the full game, you will be able to scale walls and take out enemies in a number of different ways—on land, while flying, or by stealing a vehicle and using that against your foes—so this should help keep player’s attention throughout the campaign. Dark Void is tentatively scheduled to ship for the PC, PlayStation 3, and Xbox 360 this fall.